Limit lightening your hair. When you lighten your hair using either a bleach lightener or a high percent developer you break through the external structure of your hair shaft. Although there are new products designed to limit the damage caused by lightening, it is still damaging. Save lightening services to every once in a while and enjoy the trend of having a “rooty” look between lightening appointments. Also, use a bond rebuilding product such as Olaplex to help strengthen compromised hair. Shampoo less often and appropriately. If you’re used to shampooing every day, it will feel weird skipping a day. But trust me – in time your hair will get used to being washed less, will produce less oil and become balanced. When you are shampooing only shampoo your scalp, not your ends. The shampoo that runs through your ends during rinsing is plenty to freshen. Don’t ever scrub your ends. Unless you have paint or glue in them there is no need. Stick to a deep conditioning routine. We all buy them but then they sit in our cabinet and we forget to use them, totally useless! An easy way to stick with deep conditioning weekly is to keep your conditioning treatment in the shower. Once a week after shampooing your hair, grab a towel and quickly blot the excess water from your hair. Apply your deep treatment and wrap your hair up in a clip. Continue with your shower making it slightly longer than usual – use your facial exfoliator, shave your legs, pumice your feet – after about 10 minutes rinse your hair. That’s it! Very easy and very effective. Avoid heat styling. Plain and simple heat styling damages and dries out your hair, it just does. This includes the use of hair dryers, curl irons, curl wands, flat irons, etc. If you must use heat utilize a heat protectant spray prior. Use heat on a lower setting and be quick about it, don’t let that hot tool bake your hair for too long. Learn to love the natural texture you get from air drying, or pull your hair up into a high twisted bun at night and enjoy beachy waves in the morning! Avoid cheap products with high alcohol content. Hairspray, volume spray, volume mouse, etc. High-quality products you can use sparingly. Cheap products avoid completely. Check the label to see exactly what’s in there. Avoid sun and salt. If you’re spending a day at the beach protect your hair like you would protect your skin. Avoid submerging it in salt water. If you must then saturate it with fresh water prior. Wear a hat. You can also rub in coconut oil throughout your hair, put it in a bun for the day to help protect it and add extra softness. If you start changing up your routine, even just a little bit, your hair will thank you! 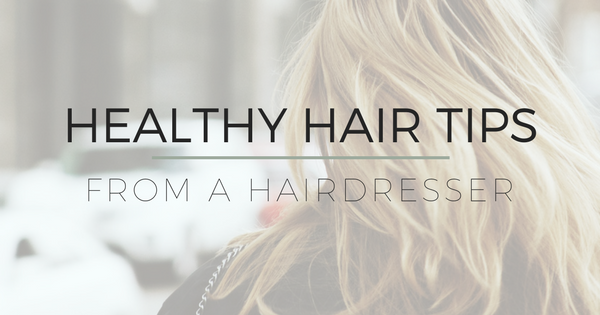 Healthy hair means shine, strength and less frizz. Who doesn’t want that? Keep up to date with the best hair tips and tricks by signing up for the be Rosie newsletter. We send out monthly emails about tips, classes, and promos! Your hair will thank you for it later!